It’s easy to forget that while the Ramones were still active, they didn’t enjoy a fraction of the praise and adoration that they do now. They never had a hit single, they never even had a hit record. They toured constantly and released records every year or every other year. Hell, they drove around in a van their entire career. A van. They saw bands they created through inspiration eclipse them in success and popularity again and again. By the time they played their last show in August 1996 at a small-ish Hollywood venue, they were already bonafide legends, they had been legends for fifteen years actually. But commercial success and worldwide acceptance just wasn’t in the cards it seemed. Now of course, that’s all changed. They’re credited not only with inventing punk rock music, but are recognized as one of the greatest bands of all time. Of any genre. Go outside and throw a stone and it will likely hit a house that has a Ramones t-shirt hanging in the closet. Marky Ramone was with the Ramones from 1978 until their dissolution (with a small break in between) and is the only surviving member, outside of lesser known stand ins like CJ and Richie Ramone. 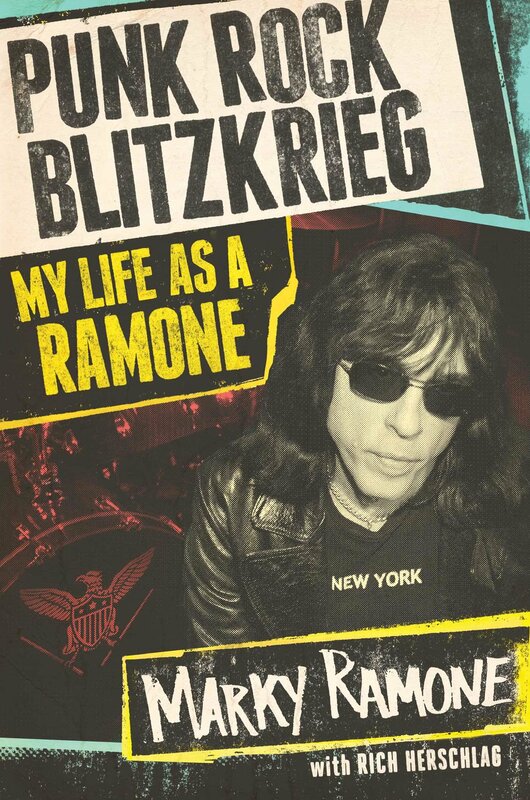 There have been many books about the Ramones and both Dee Dee and Johnny released books about their experiences shortly before their deaths, but Marky Ramone’s “Punk Rock Blitzkrieg” may be the meatiest, most enjoyable and craziest book about the band penned so far. The book starts, as do all autobiographies, with Marky’s childhood and moves into his time in many well regarded or even legendary New York City rock bands where it seemed every time he turned around he was being offered a new gig in a band that would come to exemplify proto-punk in the 70’s. He paints a vivid picture of Manhattan in the 60’s and 70’s and the legendary rock clubs that he called second homes like CBGB’s and Max’s Kansas City. All the grit and the glory, the danger and excitement of the city in its grimiest period is conveyed with no shortage of detail. His time with the Ramones doesn’t start until a third of the way into the book. Which makes sense, as he didn’t join them until he was a third of the way into his life. But this is where the book really comes alive. Every page is literally filled with juicy Ramones related anecdotes. Joey’s obsessive compulsive disorder, Dee Dee’s self destructive behavior, Johnny’s mean tempered control freak personality and Marky’s own struggles with alcoholism and his fight to regain and maintain his sobriety. It’s all here. I won’t get into too many stories because if you’re a fan of this band you should just read the book, but one particular highlight was the hijinks surrounding the shooting of ‘Rock N’ Roll High School.’ Their rabid South American fan base is also a lot of fun to hear about. ‘Punk Rock Blitzkrieg’ is an easy read. I actually read it in less than a week which has to be some kind of a record for someone who typically takes months to read a book. One issue I will say about it is that it isn’t very well written. Marky skips from story to story and back again pretty quickly and there are times when you think you’re reading about one thing and suddenly realize he’s onto another tale. It isn’t overly eloquent either. And he repeats himself a bit. But these are small nitpicky issues with an otherwise excellent book. At the end of the day, you read this stuff for the tales it tells and this book has a hell of a lot of tales to tell. Highly recommended.